This happened last week on the Mumbai Pune Expressway. We had left at around 8.45 from CBD Belapur towards Bangalore. We were driving our Mahindra XUV500. We had reached the Expressway at around 9am. We crossed the Khalapur Toll Plaza by 9.30 and entered the Food Mall to fill up some Diesel and have breakfast. Once we left, we soon entered the ghat, and reached the lone section of the Expressway that witnesses long pileups during peak hours: The hairpin bends on either side of the Amrutanjan Bridge. Now, the Amrutanjan Bridge was the site of the Reversing station for the Grand Indian Peninsular Railway [GIPR] back in the days of the British. The station was dismantled when the track took a new route and the bridge, along with a new bridge adjacent to it, became part of the Delhi-Chennai National Highway 48 [the erstwhile Mumbai-Chennai NH 4]. Due it its age, the Archaeological Survey of India [ASI] has refused to give the MSRDC the permission to modify the bridge. The MSRDC subsequently formulated a plan to build a tunnel that would bypass the entire section and hand over the existing stretch entirely to the NH. The problem with the Amrutanjan Bridge is that the six lane [three per direction] Expressway splits up. The old bridge splits each 3 lane carriageway into two carriageways of 1 lane and 2 lanes. This, coupled with the fact that there is a constant incline in the gradient, plus several sharp bends/hairpin bends and the Khandala tunnel, make driving on this stretch a pain at times. It is not uncommon to see traffic piled up for a few kilometre on either side. Now, even though I have been a regular user of the Expressway for the past two years, it has been almost a decade since we drove down in it in a car with luggage. Getting caught in traffic while ascending the ghat was a usual occurrence, mostly happening at night while returning to Pune in a Shivneri, but I have witnessed it once or twice during the day. Having mostly driven on highways in South India for the past few years, the Bhor ghat [the ghat in this stretch], was a bit of an uncommon ground for us. While driving up the slope, the clutch got regularly pressed. After a while, we could smell something burning. We passed it off as engine heat, and turned off the air conditioning and rolled down the windows, till we began to see smoke coming out of the front. We quickly changed lanes to the left, with one of us standing next to the car and stopping traffic. A guy on a scooter came over and told us that our clutch was burning and that it needed immediate attention. He also said he would charge us, but only after he fixes it, and we do a test drive. He quickly went under the car, did some tinkering, opened up the bonnet, took out the battery and used water to cool down the clutch. Upon finishing it, he drove the car up for a while, with his associate taking his scooter and following us. We did a test drive as well till the Kalra exit after which we paid him and left. He assured us that the clutch was in good condition for a drive upto Bangalore. We decided to go for a second opinion and stopped at the Mahindra service centre at Wakad in Pune. Initially, he just smelt it and said the clutch would require replacement which could take 6-8 hours, depending on the load. He then took it into the service centre to check the condition of the clutch. After a while, he came and told us that the clutch was in good condition and that the timely action on the Exoressway had ensured that the clutch remained usable. He said that the car could be driven upto Bangalore, but we’d have to be careful with the clutch. The caveat: Either press the clutch fully, or don’t press it at all. No half clutch for braking, and if we had to brake, we were to use the Hand brakes only. Now. These kind of incidents will keep happening as long as the Amrutanjan Bridge problem exists. The only way to solve the problem is to bypass the stretch altogether with a tunnel. When the Expressway first opened up, it had far fewer takers than it has today because there were numerous people who preferred the old highway. To counter this issue, the MSRDC came up with a solution. Hand over the Old Mumbai Pune highway and Expressway to IRB’s SPV Mhaiskar Infrastructure for Operation and Maintenance on the Expressway and Build-Operate for the Highway. 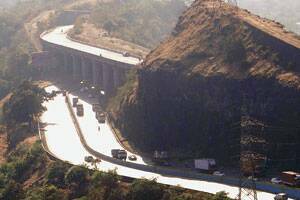 The old NH was four laned from Shedung to Khopoli and Lonavala to Dehu Road, and made a Toll Road. Naturally, all traffic started gravitating towards the Expressway which was the better alternative among two toll roads. If the tunnel is built and the existing section is handed over to the NH, traffic will still remain the same given the increase in the number of vehicles. With such conditions, it would good if MSRDC and Mhaiskar Infra regularised the services of these mechanics. By virtue of waiting at the side for a vehicle, they come under the category of both Pedestrians and Two Wheelers, both of which are technically banned. Thus, if the higher ups regularised them, it would make life simpler for IRB/MSRDC, the commuter, and these mechanics. After all, they have a specific skillset, that they out to use efficiently. Around the time when our car got stuck, there were atleast half a dozen cars, jeeps and SUVs in the half kilometre stretch ahead of us with the same issue. Inspired by incidents that occurred over the last few days, a new feature is coming up. It will be a fortnightly feature; titled The Unsung Heroes of the Transport World. The first one will be out in a few hours. The feature will talk about various people, from conductors, mechanics, officials, common citizens, police personnel, etc. All posts under this feature will be tagged under Unsung Heroes and have [Unsung Hero] in the post title. They’ll all be on the main blog and not a separate one [like features on the Stupindex]. Please do post any suggestions in the comments section. I will follow up and do my research. Guest posters are more than welcome to join in!